This coming school holiday, FRIM – MNS Nature Education Centre (NEC) will be organizing camp for kids namely “Jumbo Camp”. The camp is focusing on the study of wildlife animals, including the structure, classification and distribution of all animals, and how they interact with their ecosystems. 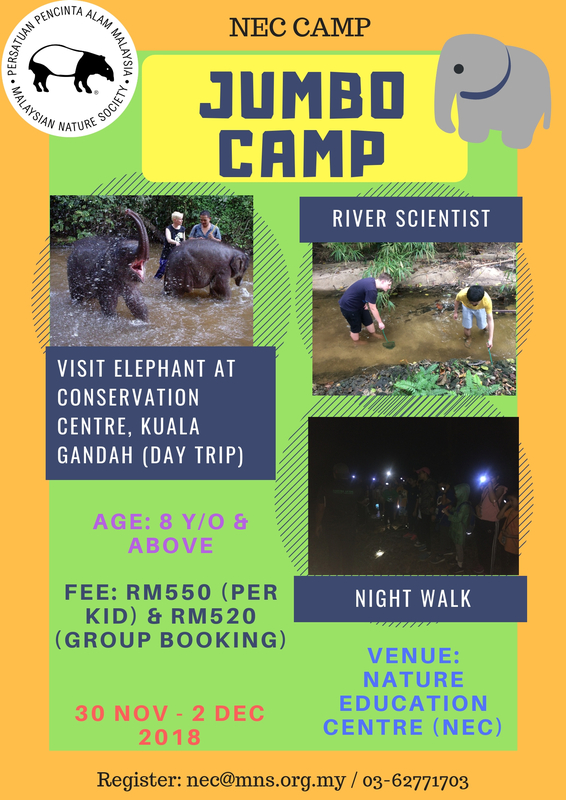 This camp provides the opportunity for the budding conservationist to explore the endangered animal which is elephants in Elephant Conservation Centre, Kuala Gandah, Pahang and join volunteering work there. This programme also provides the opportunity for kids to have fun and learn from educational hands-on activities such as nature walk, river scientist, nocturnal walk, games, and others. Our camp is designed to instil enthusiasm and encourage the children to appreciate our wildlife and nature as well as gain a range of life skills for personal growth, good communication and teamwork. We are now open for enrollment and welcome young conservationist aged between 8 to 15 years of age. Venue : FRIM-MNS Nature Education Centre, Forest Research Institute Malaysia (FRIM) Kepong, Selangor and Elephant Conservation Centre, Kuala Gandah.